The original Pantheon was built in 27 BC but was destroyed in a fire in 80. The present building was made in 126AD during the reign of the Emperor Hadrian. Pantheon in Latin/Greek means “to all the Gods”. It was originally built as a Roman temple. Since the 7th century it has been used as a Catholic Church. It’s the best preserved ancient Roman building with an original roof. In the roof is a hole (oculus). Oculus means eye in Latin language. 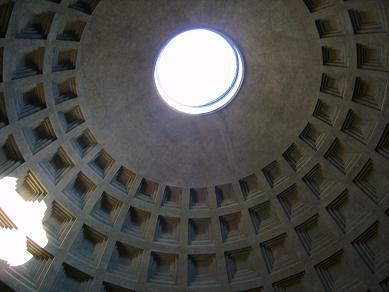 The Oculus in the Pantheon has always been open to the weather. Rain is carried away through drains in the floor. 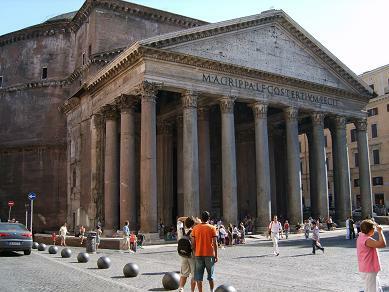 The Pantheon is in the historical center of Rome, less than 10 minutes walk from the Trevi Fountain. From metro stop ‘Piazza Barberini’ it’s 7 minutes walking to Trevi Fountain and about 15 minutes to the Pantheon. Piazza Navona is also nearby. 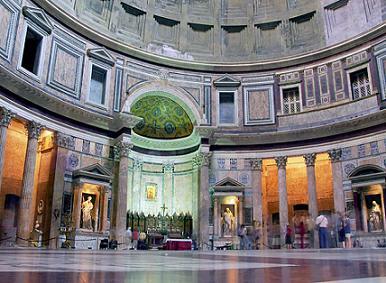 Opening hours Pantheon: Monday to Saturday from 8.30 to 19.30, Sunday from 9.00 to 18.00. Admission is free.